Welcome to get Galaxy 🦄Unicorn Glass Tech Theme! You can get Galaxy Unicorn Glass Tech Theme from personalized wallpapers, characteristic lock screen and exquisite icon packs! 🦄It includes dozens of uniform icons and wallpaper art, with which you can easily personalize your device. All artistic app icons are to give you a distinctively stylized phone for free. It is Galaxy Unicorn Glass Tech Theme with Galaxy Unicorn Glass wallpaper! Install this Galaxy Unicorn Glass Tech Theme right away and feel your new 3D Glass Tech live wallpaper. 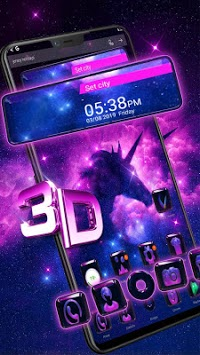 3D Glass🦄 Tech Galaxy Unicorn Theme is designed especially for launcher users. Long press to activate the unique set of live interactive effects of each 3D theme. You will be amazed by the endless surprises. To use 3D Glass Tech Galaxy Unicorn, there is no need to root. You can easily Protect apps from Peepers by hiding them in special folders. 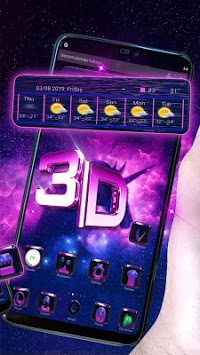 3D Glass Tech Galaxy Unicorn has world leading 3D transition effects on screens and folders, elegant and simple in screen switching and navigation. Here comes the new 3D Glass Tech brief theme! With neat Galaxy Unicorn wallpapers and delicate icons, the theme makes your phone more attractive. Galaxy Unicorn Glass Tech Theme includes Unicorn, Galaxy in wallpapers, brief lock screen, Colorful icons, providing neat experience and so on. brief lock screen once you have set the lock screen, it offers full protection over your privacy, making your phone more secure. Colorful icons decorate every folder and icon well for you, pretty cool and fashionable. 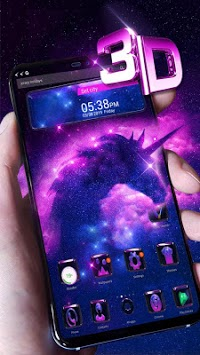 3D Glass Tech Unicorn Galaxy elegant interface 3D effect weather forecast and dynamic 3D clock, these stylize your phone as well. Wallpaper Center There are various HD and brief dynamic live wallpapers. After installing Galaxy Unicorn Glass Tech Theme, you can set up Flower neat keyboard theme, so that your phone will be totally dressed up. Galaxy Unicorn Glass Tech Theme supports a variety of Android phone models. 🌈 Plenty of different neat themes. 🌈HD graphics and Open GL. 🌈More than 99% of the mobile phone devices that is compatible. 🌈Brief Wallpaper that supports the horizontal screen fully and looks amazing and neon on the tablet as well as on the phone. Make the most of your phone with brief wallpapers and advanced features. Enjoy this free and neat dynamic wallpaper! Find 3D Glass Tech Galaxy Unicorn wonders in one of the best wallpapers. The fun is worth trying. Download brief wallpaper for free and enjoy the high resolution wallpapers with surreal parallax effects from all over the world, improved Galaxy beauty. Also, with Galaxy Unicorn neat backgrounds, your Samsung or Huawei phones will be neat and brief. Before installing Galaxy Unicorn Glass Tech Theme, you need to install our launcher. Have fun with Theme!